Which one of us hasn’t had one of those days when we actually considered if we couldn’t hide under our desk and take a nap? Well, William just says Carpe Diem. He actually crawled under here while I was sitting at the computer, working. As you can see, he squeezed Bunny and Puppy under there, too. He’ll finish that powerpoint deck later. Just like George Costanza in his Yankees office! 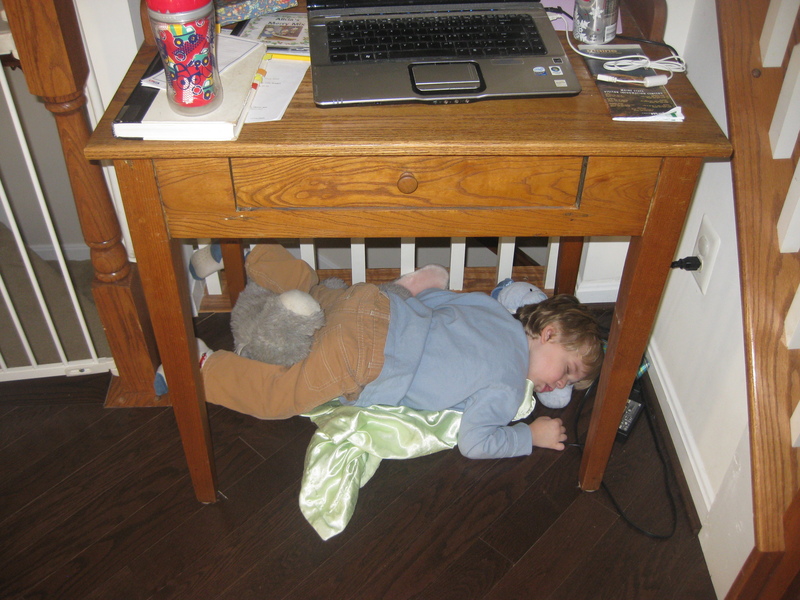 Why do kids love that spot under our desks in front of our feet? My daughter is nearly six and thank goodness I have an enormous desk. Of course, it is a pretty awesome hidey-hole. All dark wood and coziness. She’s there now. With the dog. The sixty-three pound brown dog. One hundred and thirteen pounds of pent up energy under my desk. And I wonder why I don’t get more work done!